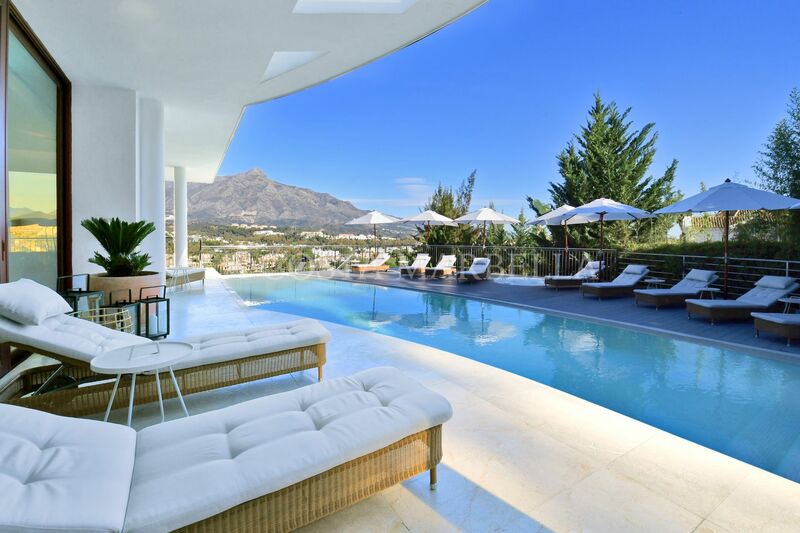 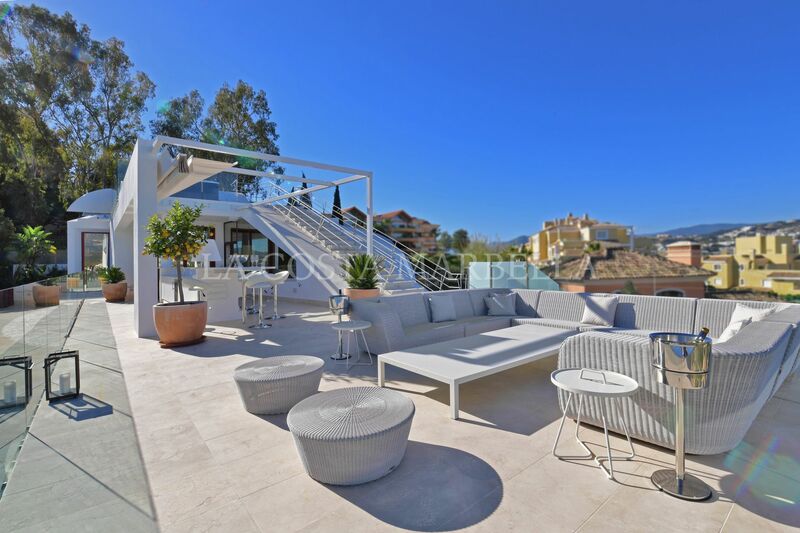 This is an extraordinary contemporary villa located in the exclusive area of Nueva Andalucía, only a 5-minute drive from Puerto Banus, beautiful beaches and great restaurants. 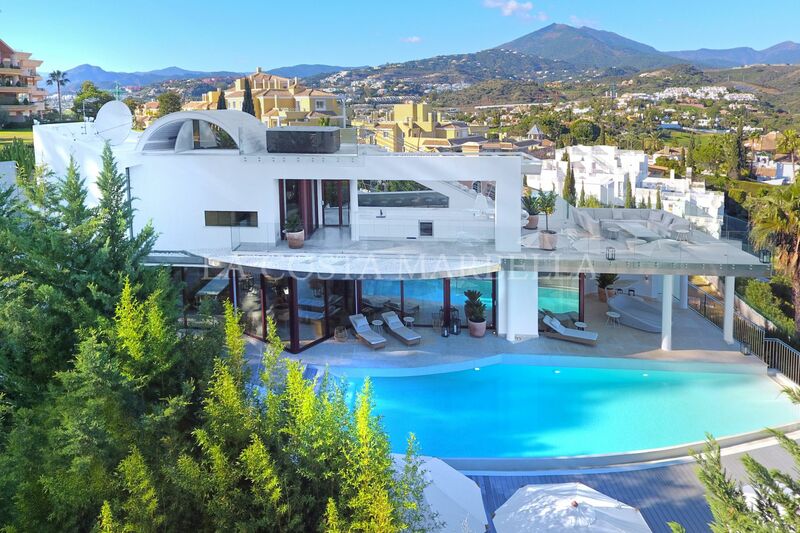 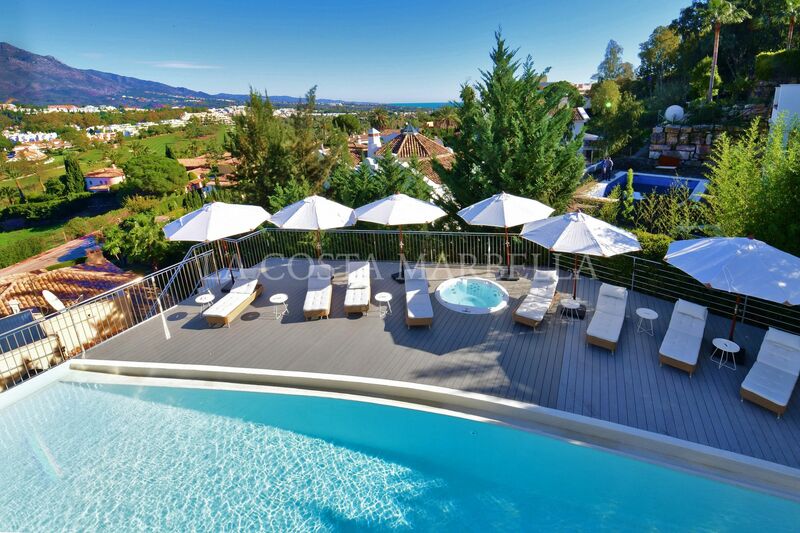 This newly renovated villa is built to the highest standard and designed by the renowned architect Angel Taborda, known worldwide for his avant-garde style. 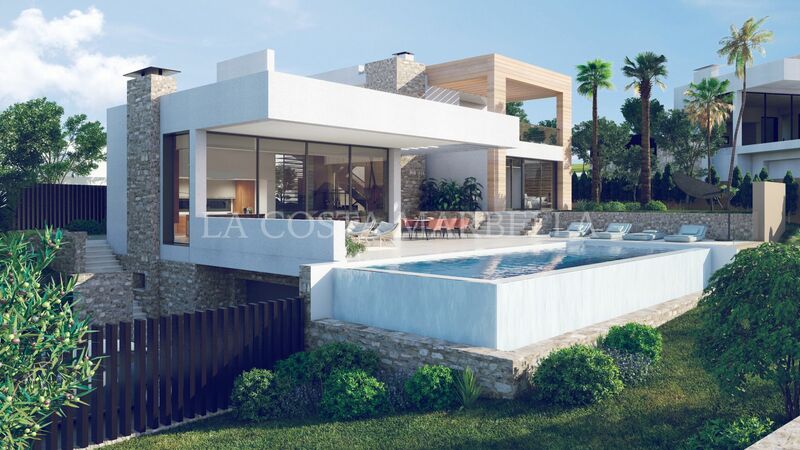 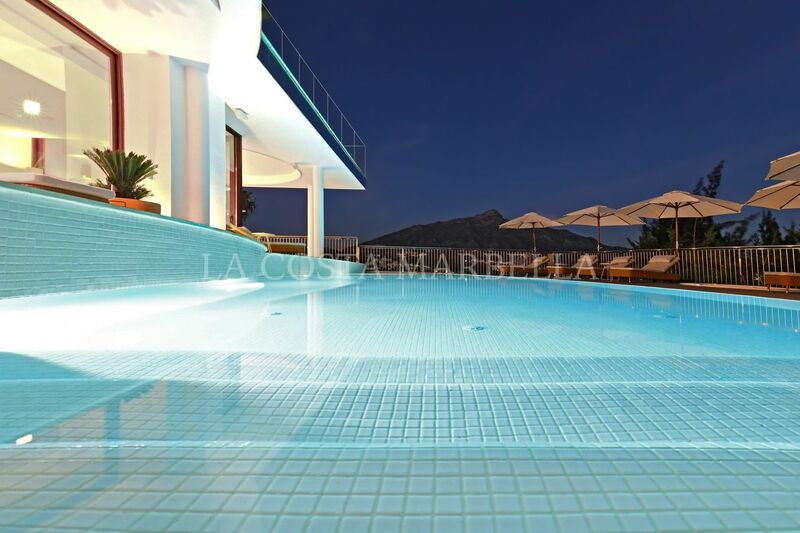 When entering this remarkable villa the modern architecture harmonious melt together with a panoramic view over the La Concha Mountain and the Mediterranean Sea. 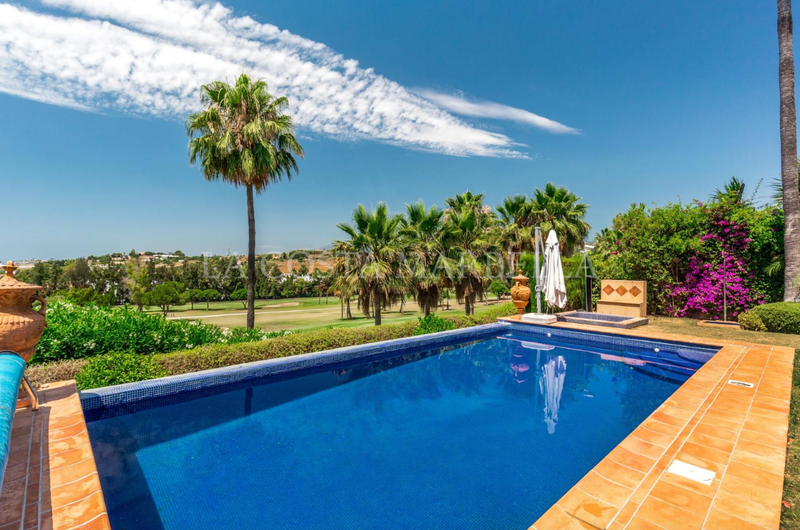 You instantly feel at ease while exploring the rest of the beautiful house – divided over three levels, having carefully considered the distribution to maximize the light and magnificent views surrounding the property. 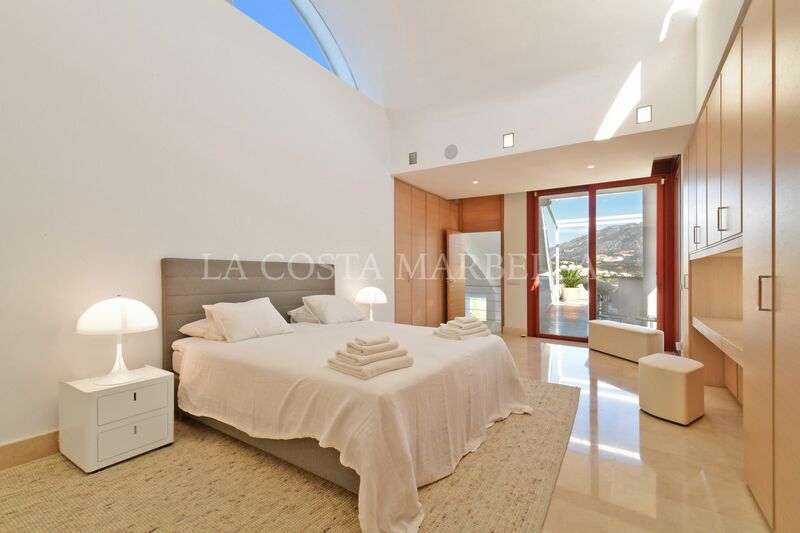 From the main entrance the living room in its white interior floats together with the beautiful natural light coming in from the full-size windows facing the amazing view and pool area. 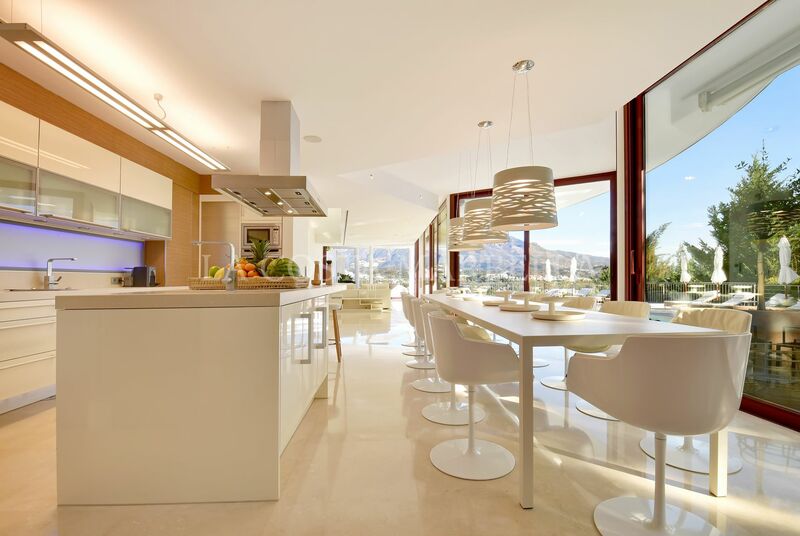 Turning to the right – the fully equipped kitchen presents itself with a dining area fitting 16 people. 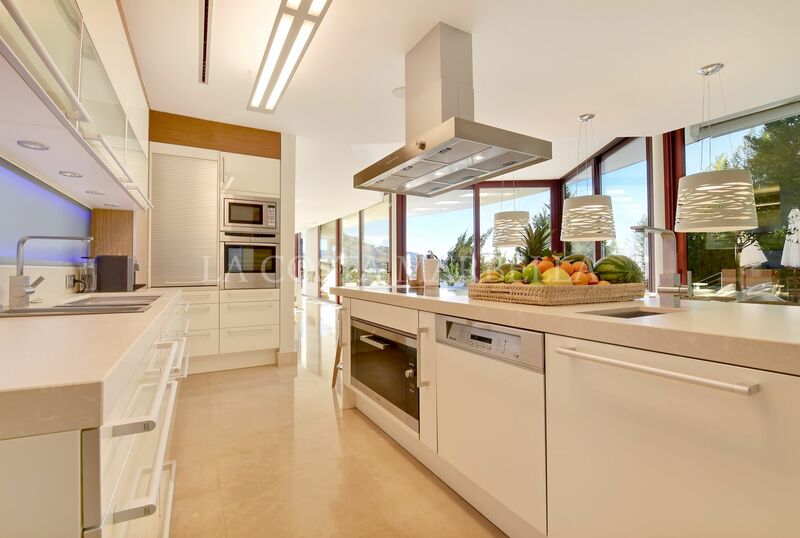 From the kitchen area, there is direct access to the scullery and laundry room with washing machine and tumble dryer. 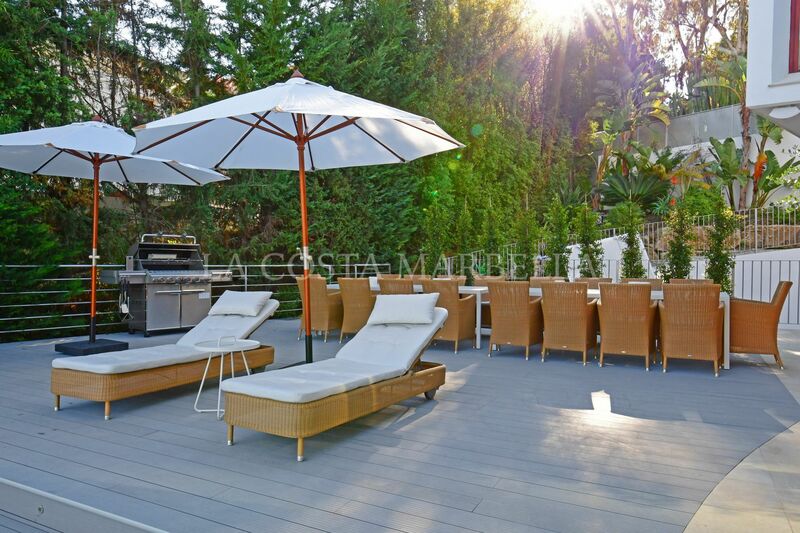 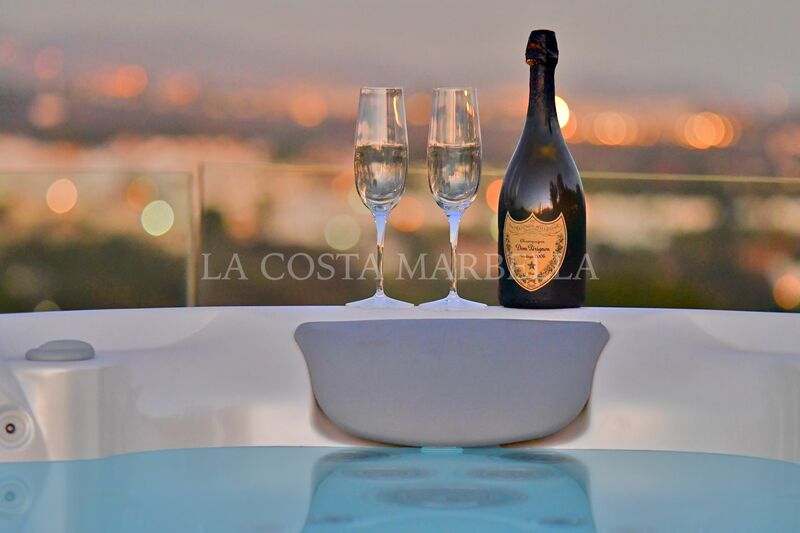 Outside you have a spacious terrace with palm trees, a large heated infinity pool and five-person Jacuzzi. 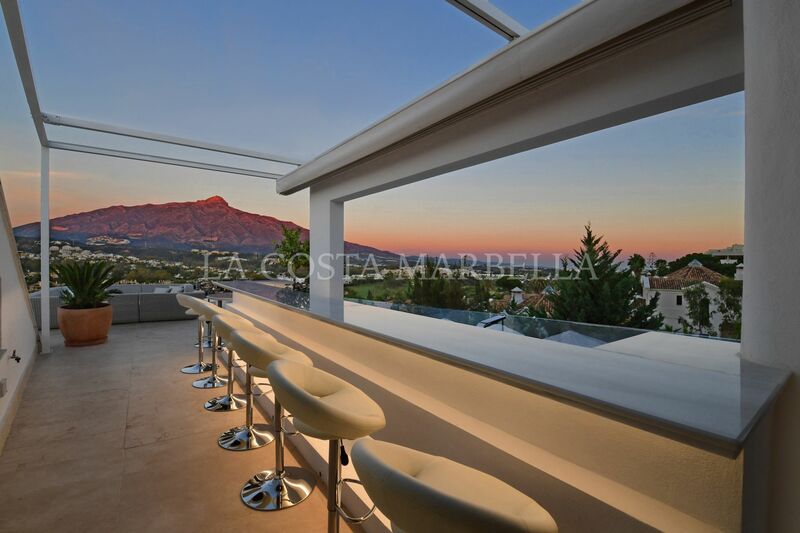 The outstanding barbecue area is ideal for entertaining and dining under the stars, while the partly covered bar and the lounge area on the second floor terrace is ideal for drinks overlooking the most magnificent view of mountains and sea. 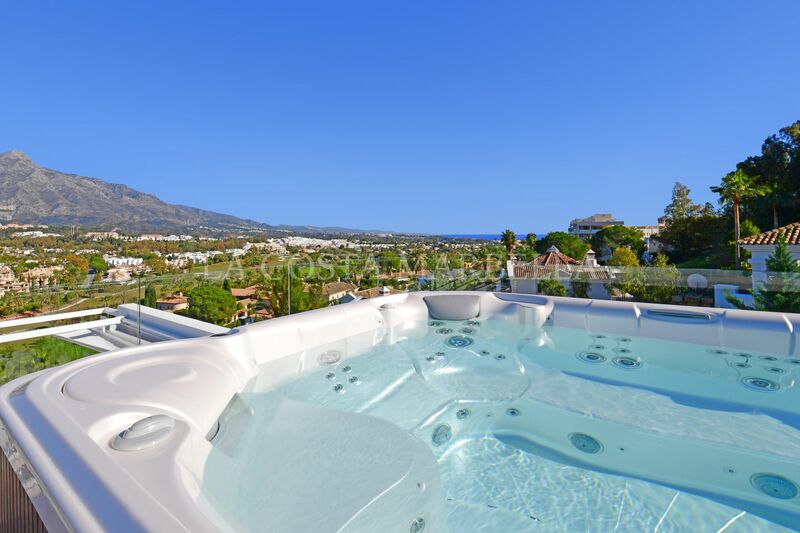 You can even take it to the next level – to the eight-person luxury Jacuzzi on the top terrace with a 360 view overlooking the entire valley. 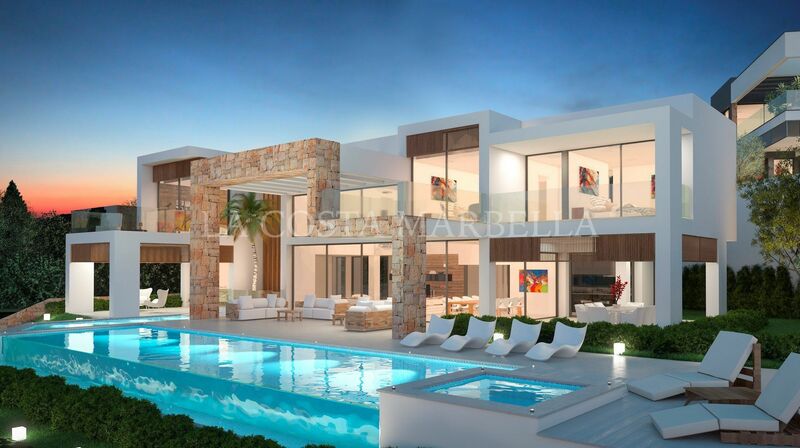 Throughout the property there are large windows and open spaces, perfect for socializing and entertaining whilst the distribution and location of the seven bedrooms (sleep 16) allows for total privacy at the same time. 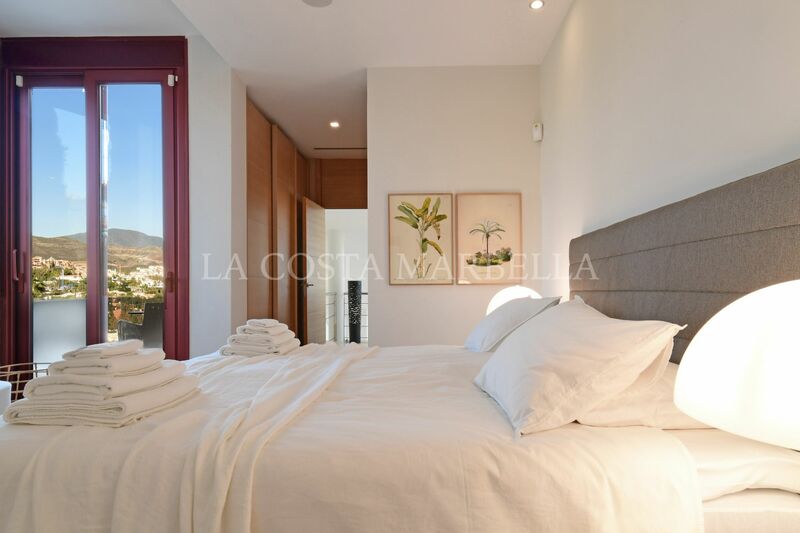 You will find two master bedrooms on the second floor with access to the bar and lounge area. 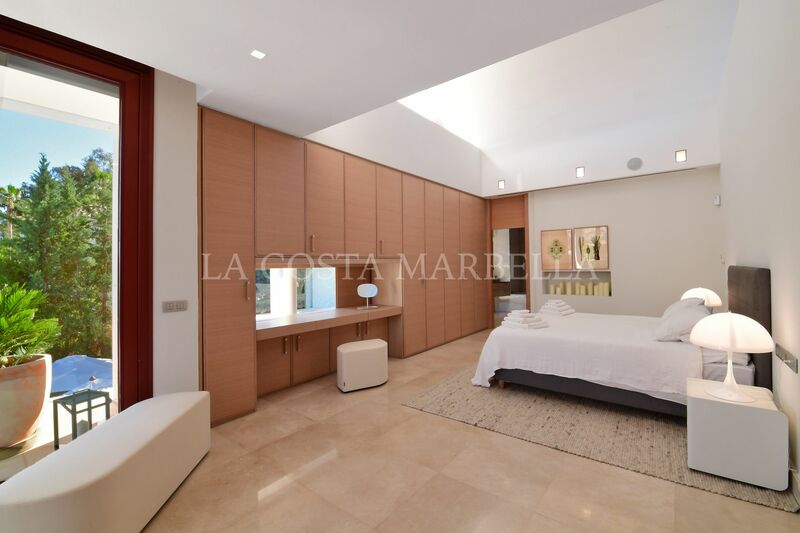 The impressive master bedrooms are spacious with great en-suite bathrooms. 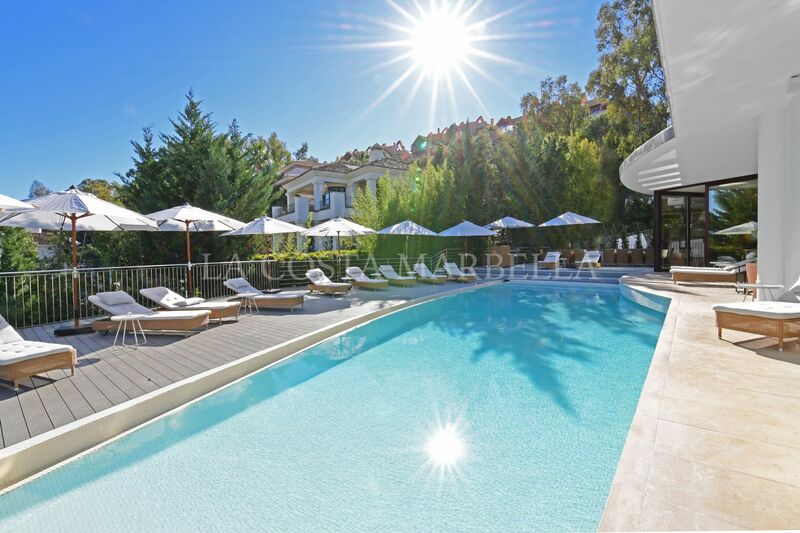 Lower Ground has five bedrooms with six king-size beds and 4 en-suite bathrooms, all with access to terrace and pool area. 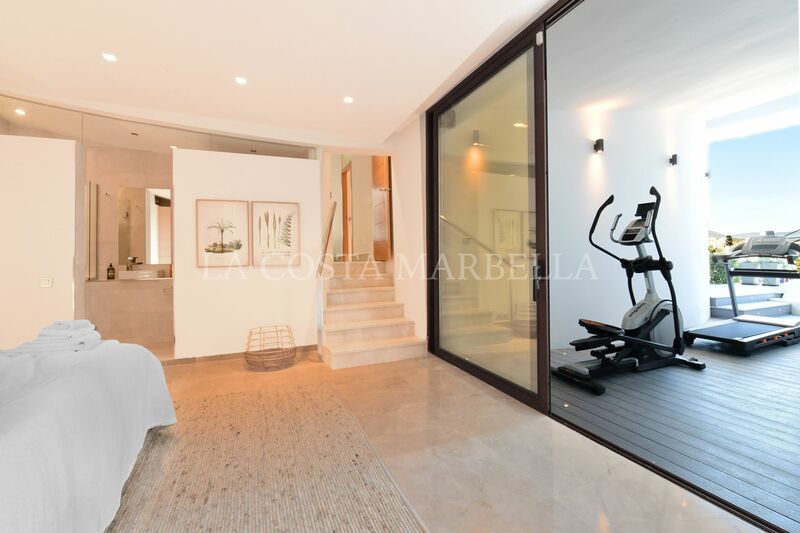 Here you will also find the cinema room/game room with pool table and the out-side gym. 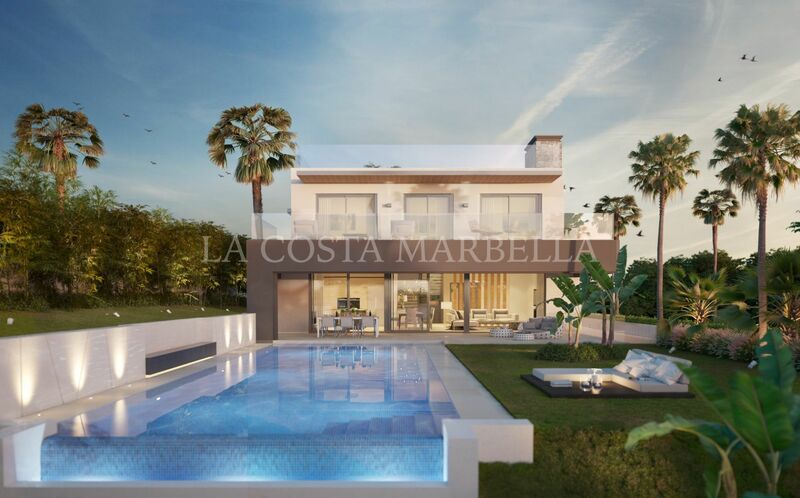 The house is built with quality materials and has unique features such as external and internal lighting with the latest energy saving LED technology. 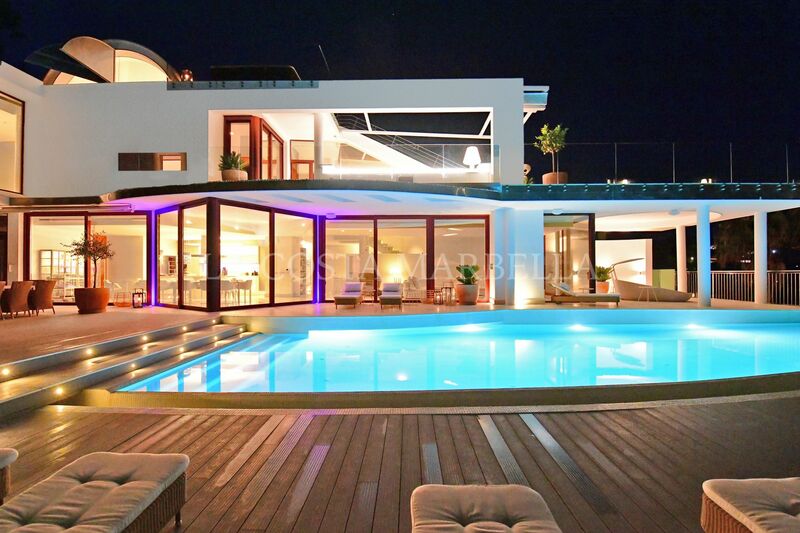 Surround sound speakers. 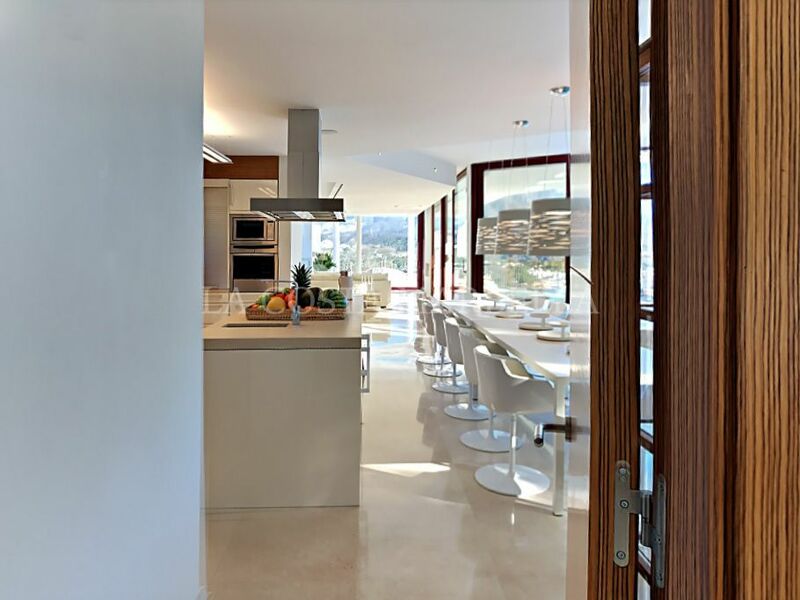 Poggenpohl kitchen units with Gaggenau white goods, including several refrigerators/freezers, wine cooler and ice cube machine. 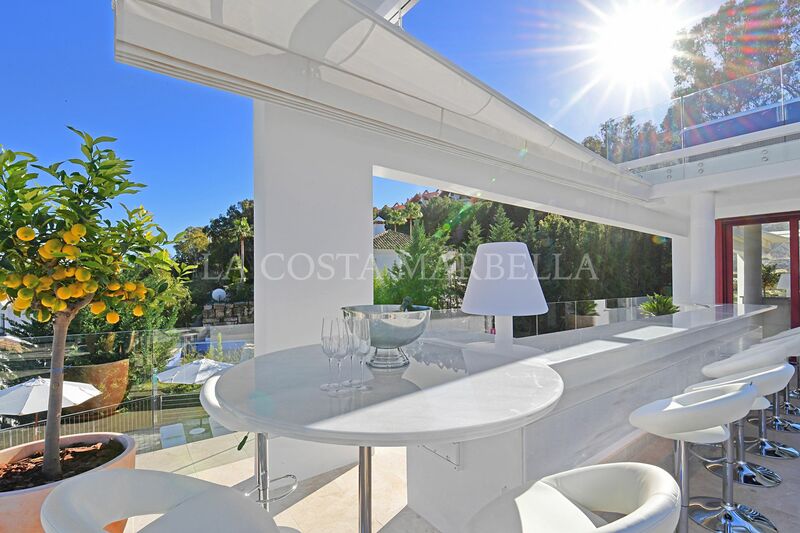 Second floor Bar with cupboards, dishwasher, drinking water, refrigerators, wine cooler, ice cube machine, freezer and teppanyaki dining table. 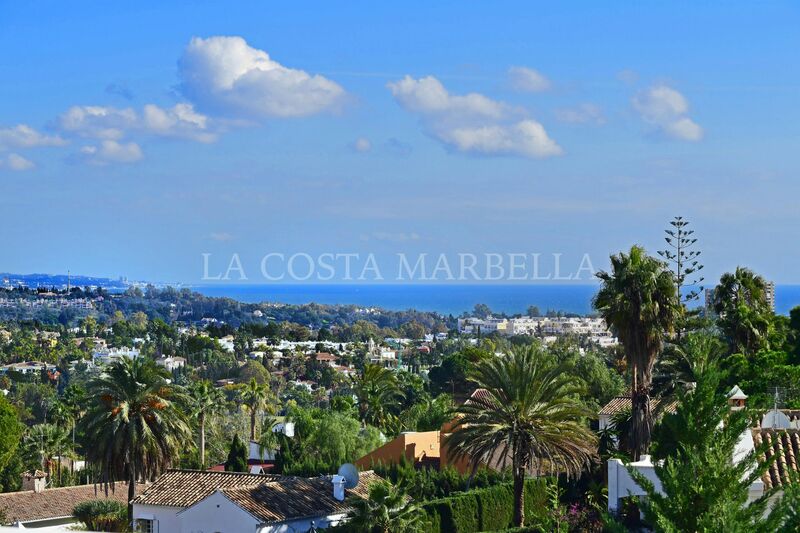 Please, send me more information about ref V845, Villa in Nueva Andalucia or similar properties.